Create a peaceful, meditative light with this 5-votive candle holder tray. This contemporary candle holder showcases five candles and beautifully accents any living space. This decorative candle holder has a calming Asian-inspired design. 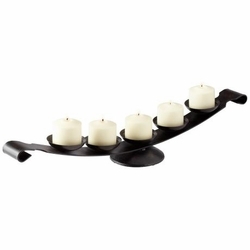 A tray in black bronze finish holds 5 votive candles. Add your own candles to this home accent for a beautiful light accent on a fireplace mantel or in any room. • 1"x1" votive lights not included.